As a cat lover what is one of the biggest problems you have besides, cleaning your litter box? That’s right where to put it so it’s not an eye sore. Well we have a solution to both problems. First cleaning your litter box; we have a brand new product launching this month called SiftEase, and it will make cleaning your litter box easier, and will save you time and money as you won’t be contaminating your litter anymore so you’re using less and it will take only a little over a minute per box. Check out our website for details. Ok; now that we’ve solved the nasty, lets talk about hiding this little gem in plain site. There are many clever ways to hide your litter box, Pinterest has some fun examples and I’ve included a picture of one here. When you live in a small space it is often necessary to keep your litter box in a common area so how can you do that, and not have your guests and families running for the exits? One idea is this cabinet, you can pick one up at the Habitat Restore and with paint and a few tools turn it into a cute cabinet that will hide your box and your SiftEase cleaner. 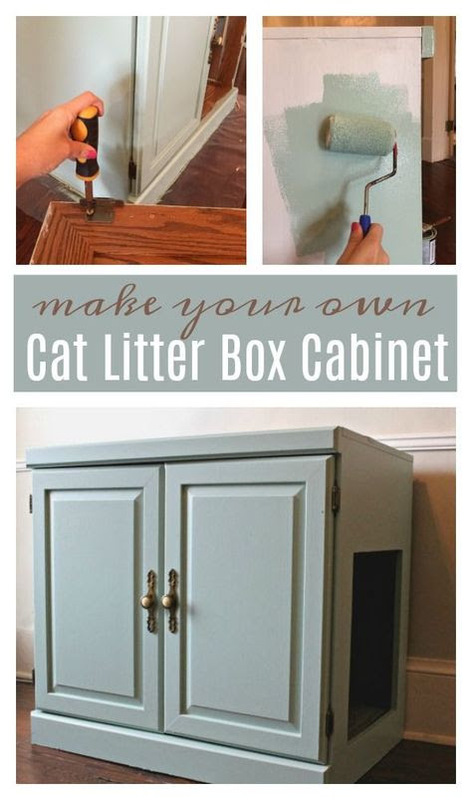 There are other clever ways as well; you can take lattice panels and create your own box to hide the kitty’s potty in; or you can take an old chest, or storage bench and create a nice seating arrangement and a hidy-hole for the litter box. Check out our photos and get creative; or share your own ideas with us.